Good morning, dear friends! In a few days we are going to celebrate Easter in Greece, so we present you ideas for the festive table. We began with our avocado potato salad. Today we move on to the main dish. 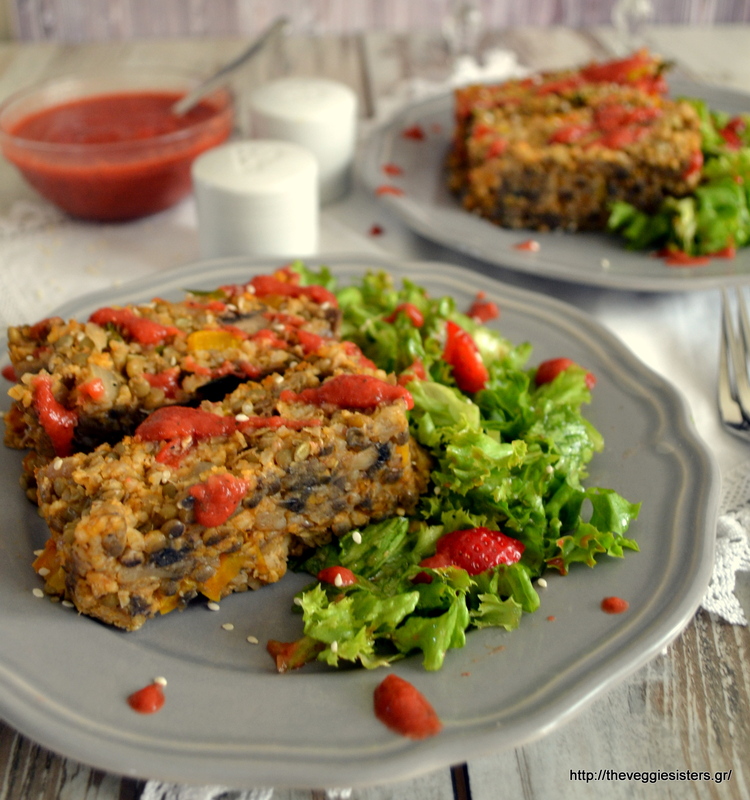 A yummy lentil loaf with rice and veggies. A hearty, wholesome dish packed with protein and flavour. 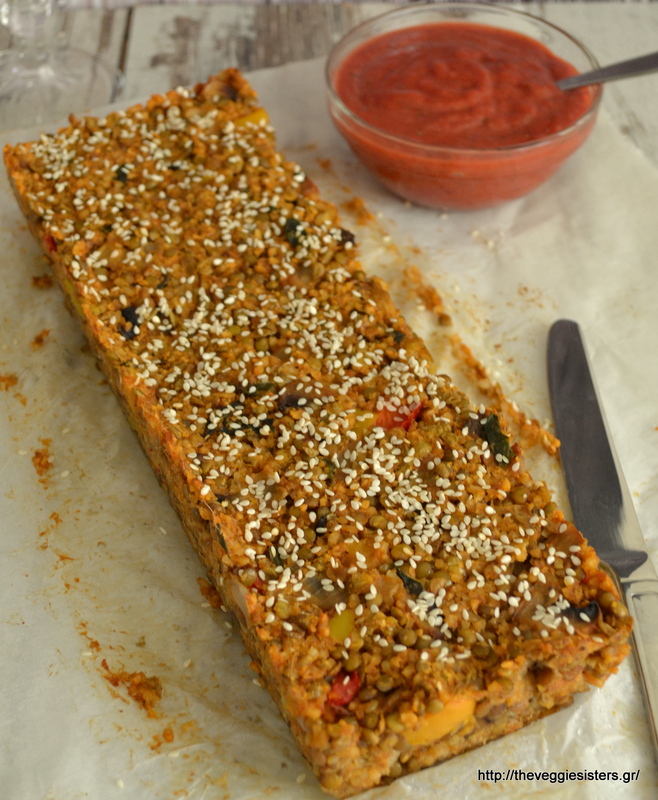 You could never guess that this tasteful loaf is made with lentils. Even meat eaters will love it. The strawberry sauce is so refreshing and pairs well with the loaf. The combination may sound strange but trust me it does pair well! Do try it and I am sure you will enjoy it as well! Waiting for your feedback, guys! We accompanied it with a green salad and used the strawberry sauce as dressing as well. I wish you have a wonderful weekend. Mine will be really busy! My hubby and I will be working on a sweet project. After his successful Easter bread I hired him as my sous chef. Men can work wonders when cooking, dont you agree? We have a brilliant idea on our head about the festive dessert. We hope it will turn out as we have been dreaming! Have a lovely weekend, people! Cook rice and lentils seperately. In a non sticking pan cook finely chopped mushrooms, peppers, onion, mint and parsley. Pour the wine. When cooked through, add tomato paste, garlic powder, 1 Tbs olive oil, salt and pepper. In a bowl place lentils(drain them first, season with salt and pepper and mix them with 1 Tbsp oil ), rice (ground first in a blender), oats, and veggies. Stir to combine. Add nutritional yeast, 3Tbsp oil and check if it needs salt or pepper. Cover with a plastic wrap and keep in th fridge for 1/2 hour. Empty in a cake tin lined with parchment paper and top with sesame seeds. Bake in preheated oven at 180C for about 40 minutes. Remove from oven and after 10 minutes remove from tin. Allow to cool before cutting. The sauce pairs well with the loaf. Just pulse all the sauce ingredients in a blender until smooth and drizzle on the loaf. Enjoy! 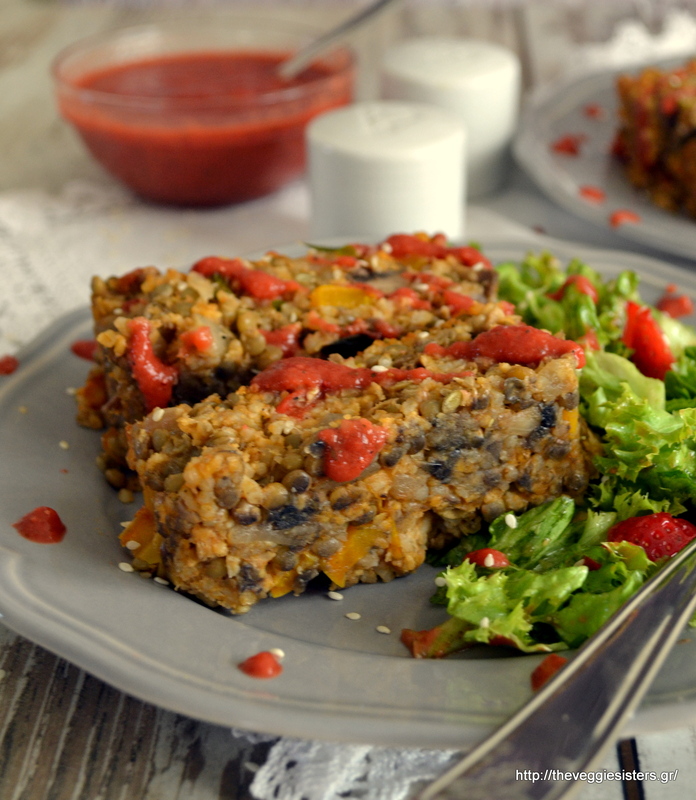 Share the post "Lentil loaf"